Well, even if you don’t have the chance to go to Abruzzo, you can have Abruzzo come to you. Abruzzo has wonderful lamb dishes,—perhaps most famously those little skewers called arrosticini—but lamb also makes it into the region’s pasta sauces. This one, Lamb and Red Pepper Ragù, I think is particularly appealing. The peppers lend a subtle sweetness that complements the taste of the lamb perfectly. It’s quite straightforward to prepare, as are many of the region’s dishes, and makes for a nice change from the usual sugo di carne. In a saucepan, preferably made of terracotta or enameled cast iron, gently sauté the garlic cloves and bay leaves in a generous amount of olive oil for just a few minutes, until you can smell the garlic’s aroma and the cloves are just beginning to brown. Add the lamb and continue sautéing, seasoning with salt and pepper as you go. If using ground lamb, sauté just until the lamb has lost its raw color. If using lamb in pieces, you may want to let them caramelize a bit. Add a splash of white wine and let it evaporate. Add the tomatoes and the red bell pepper. If using canned tomatoes, just crush them between your fingers as you add them to the pot. If using fresh tomatoes, you’ll want to blanch them quickly to loosen their skins, peel and seed them, and then cut them into dice before adding them to the pot. Cover and turn the heat down to very low. Let the ragù simmer very gently for about 1-1/2 to 2 hours, until the lamb is perfectly tender and the sauce has developed a rich flavor. Serve with homemade spaghetti alla chitarra or another the pasta of your choice (see Notes). If you want to hew close to tradition, buy some lamb shoulder or lamb shoulder chops and cut the meat into small pieces, then cut the peppers into thin strips and proceed. For this recipe, I’ve made things easier for you by offering the option of using ground lamb, which is generally easier to find in our markets and, of course, saves you the trouble of cutting up the meat yourself. If you want more background on the differences between US and Italian lamb and it cuts, check out the Notes in our post on Lamb and Peas stew. As for the pasta, spaghetti aka maccheroni alla chitarra is the pasta of choice for Lamb and Red Pepper Ragù. I would not substitute regular spaghetti. Even if “Spaghetti Bolognese” is wildly popular internationally, the truth is long, thin factory-made pastas aren’t really ideal for meat sauces like this one. (Spaghetti alla chitarra is an exception because its rough and porous texture allows it to absorb the sauce perfectly.) Instead, you could go with tagliatelle or fettuccine if you want another long pasta, or with a shorter pasta like penne rigate or rigatoni. Besides the cut of lamb, there are subtle variations on the recipe for Lamb and Red Pepper Ragù. The bell pepper could be yellow, or a combination or red and yellow. Green pepper is also a possibility, but it has such a different taste from its riper cousins, I wouldn’t personally recommend it. Rosemary and/or marjoram sometimes make it into the pot, along with a pinch of peperoncino (dried hot red pepper). In a saucepan, preferably made of terracotta or enameled cast iron, gently sauté the garlic cloves and bay leaves in a generous amount of olive oil for just a few minutes, until you can smell the garlic's aroma and the cloves are just beginning to brown. Add the tomatoes and the red bell pepper. If using canned tomatoes, just crush them between your fingers as you add them to the pot. If using fresh tomatoes, you'll want to blanch them quickly to loosen their skins, peel and seed them, and then cut them into dice before adding them to the pot. Serve with homemade spaghetti alla chitarra or another pasta of your choice. Beautiful recipe and we bet it’ll taste amazing when served with a rich tannin wine like Xinomavro from the Macedonian (north) part of Greece. Can’t wait to give this a try, as we do have goat shoulder in the freezer from Easter. Excellent dish Frank!!! I shared with my grandson your lobster recipe a while back . I was a triple hit. I have on the stove this very minute you lamb Ragu dish from Abruzzo. With an hour longer to cook it tastes like it will a home run. I used home made French wine for an extra dimension. Fantastic, Joseph! I hope you enjoyed this one, too. And the wine, of course! A damp and cold night in Gavi and although I am enjoying the typical food of the area, this pasta would certainly be welcome for dinner tonight. I look forward to giving it a try when I return to California. I really enjoy your site very much. Thank you for the beauty you share with us. Love lamb! I’ve had it in pasta sauce, but never used it myself. I’ve got a bunch on lamb in the freezer — I know what some of it is going to become! I don’t know much about Abruzzo cuisine, but what I’ve had I’ve really enjoyed. I remember my first introduction to it, years ago, at an Abruzzo restaurant in Boston’s North End. Really good stuff! Anyway, delish dish — thanks. I love lamb. This looks fabulous! This is one of my family’s favorites. 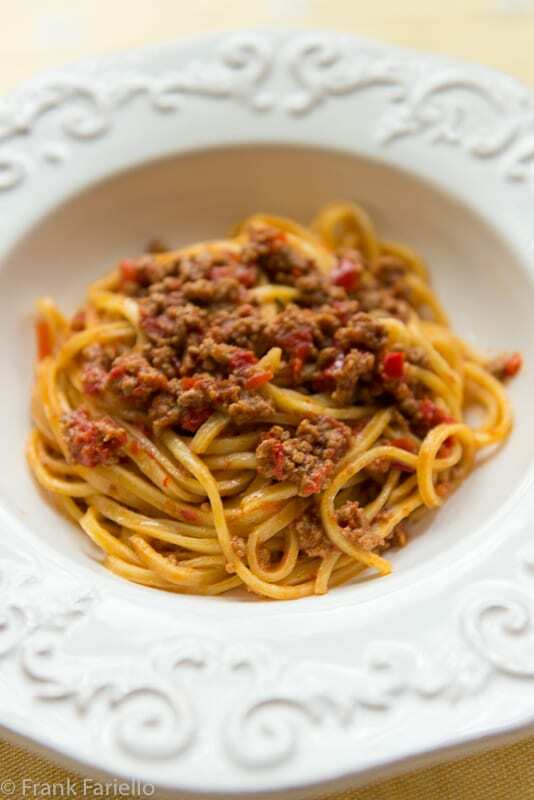 Well, on the Italian side anyway… Even though they are Sicilian, this dish is often served at family gatherings and, when I have made it, I used diced lamb and it was wonderful. I love the ground lamb idea, though. Quite. A bit simpler! Thanks for that tip! You’re welcome, David! You know me, anything to save a little time and effort. Well, not “anything”, but in this case I think it works, although admittedly the small dice does produce a more interesting mouth feel. I am a big ragu fan but have never made it with lamb. I have to try it. I can get fresh made pasta in my town, it is very good, but I don’t think he has spaghetti alla chitarra, I just substitute one of the pastas you suggested. I wish I could have this meal on a terrace somewhere in Abbruzzo . Now that would be wonderful, wouldn’t it? Husband loves, LOVES lamb – which is getting harder to find here. (Lamb shoulder used to be readily available at Farmer’s Market.) It’s a nice change from our standard ragu – next time ragu is on the menu will give it a whirl. Worth a try! Too bad that lamb is getting harder to find. It’s such a delicious meat. I actually like it better than beef. I simply can’t wait to make this recipe once we get back home. We have lamb in the freezer waiting for a delicious recipe and this is it. And homemade pasta is a must. Great recipe, Frank — thank you for sharing. Funny, but my hubby just commented before I read your recipe that once we’re home we’re making different pasta sauces. Buona serrata! Thanks, Marisa Franca. And enjoy the rest of your trip! I have also never made lamb ragu, I will have to try soon, it’s surely fabulous! Do let us know if you like it, Letizia! Having just returned from several glorious days in Abruzzo visiting one of my producers, I was delighted to wake up to this post. The timing was perfect, Paula. Glad I could bring back memories of your trip. PS: She was from Ascoli Piceno but her friend came from Calabria and the receipe was blend of regions. I’m familiar with two pasta timbales, one from Campania and the other from Sicily. (In terms of baked pastas, Le Marche is famous for its lasagna called “vincisgrassi”, which I’m sure you know.) Your mother-in-law’s timbale sounds like a delicious personal recipe that doesn’t exactly correspond to any single traditional recipe, but if you learn the basic technique common for making a pasta timbale, I’m sure you’d be able to recreate your mother-in-law’s with just a little trial and error. Your question reminds me that I’ve been meaning to post a timballo di maccheroni for some time now—do look out for it soon! PS… Also a reminder for me to look for the chitarra next time I am in Italy! PPS – I found a chitarra maker on Amazon! Very excited! You beat me to the punch, David… I was going to tell you you needn’t wait til your next trip. Anyway, enjoy your chitarra! Frank, discovered this ragu a year or so ago…use yellow & red peppers and the sauce absolutely, absolutely needs peperoncino! As far as the pasta…chitarra aka tonnarelli is the perfect shape for the ragu because they both come from Abruzzo. This probably sounds strange, but we brought home packages of dried chitarra from Rome last fall just in case we were too lazy to haul out the chitarra and make our own. BTW…chitarra quickly became the fav. in this house! Must be the mouth-feel or something! It really is the ideal pasta for this dish. And cacio e pepe, too… And so easy to make if you have the “chitarra”. I love lamb, but would never have thought of using it in a ragu. This looks fabulous! Unfortunately, I can’t eat Spaghetti alla chitarra because of a wheat sensitivity. But I’ve recently discovered a fantastic gluten-free (thus wheat-free) tagliatelle made by Jovial. I can’t wait to try your Lamb and Red Pepper Ragu with it! I’m sure this would be fabulous with those tagliatelle. Do let us know how things turn out.